The Class-I Research and Development station is designed to allow scientists to leave behind the restrictions and drawbacks of planet-side laboratories. By placing a lab in space, researchers can perform sensitive experiments that warrant a zero-gravity environment, or conditions free of a planet's local magnetic field. Although this station is designed with zero-gravity labs, it also facilitates a broad spectrum of other research environments. Such large, multipurpose installations help reduce construction costs of research facilities; building in space reduces the amount of planet-side real estate required, and the investment can often be shared amongst many cooperative factions or governments - an advantage that, due to government interests, is usually impossible with planet-side facilities. Construction in space also creates a more secure perimeter and security profile, as the station can only be reached via space-worthy transports. The Class-I R&D station is designed to be practical and efficient. The long central corridor runs the entire length of the station, connecting both the docking port and docking bay with the center of the station. The bulbous central spire houses the main recreational, dining, and living quarters for the station's three to four hundred crew and resident research staff. The critical support systems are also located in this central area for multiple reasons: to protect the units from hazardous incidents which could be further compounded by research materials, shield the labs and offices in the research ring from reactor radiation which could potentially affect crew health or research results, and allow specific areas of the research ring to be isolated in the event of contamination or hull breach without interfering with the overall operation of the station. The research ring that encircles the central spire houses the station's various labs, observation decks, and research offices. Most of the laboratories found within the ring are equipped with independent gravity generators, allowing scientists to adjust the local gravity as required by the experiments being conducted, without disrupting the gravity of the entire station. Being the most basic of the four stations in its class, the Class-I R&D station does not have the storage or defensive capacities of larger designs. Although the single docking bay is large enough to maintain a small fighter squadron, it can only house the smallest of freighters, making the lone docking port much more critical for receiving supplies. The station is equipped with a token battery of heavy lasers and limited sensor array, making it a potential target that is reliant upon interceptor fighters or other defense systems for protection. 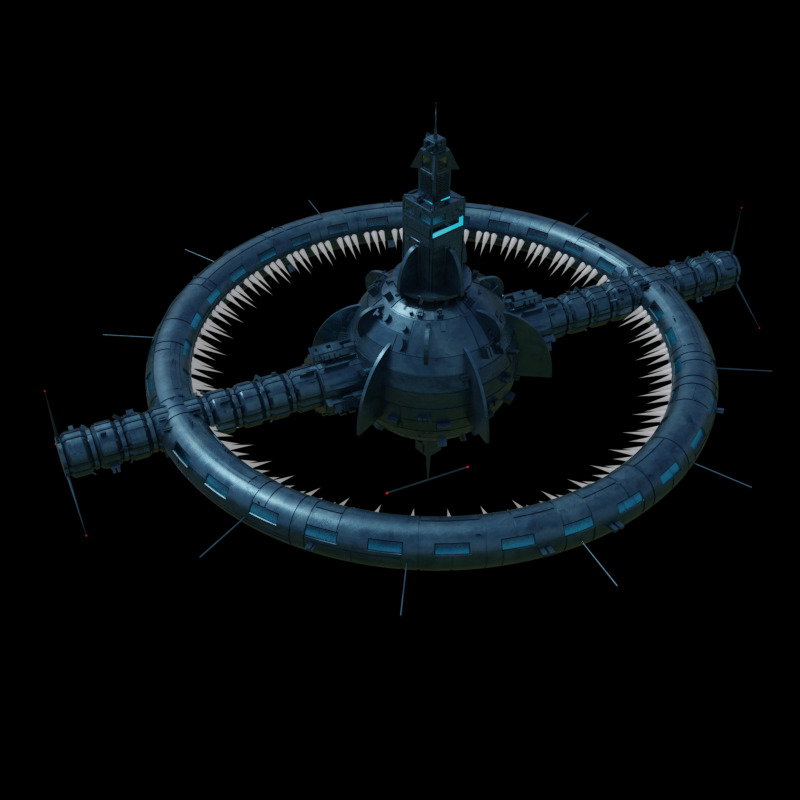 Though the aforementioned shortcomings render this station unsuitable for unprotected use within a system, they do not make it obsolete, especially if built within a heavily defended system or as a deep space hideaway.